Early Registration Period has closed. Accepted Players will be notified by email by April 15, 2019. Regular Application now open Applications and payments must be received by May 31, 2019. Accepted Players will be notified by email by June 8, 2019. Discounts are available for applicants with qualifying UTRs: Boys 11.00 and above and Girls 8.00 and above. Discounts are based on actual UTRs, ratings will not be "rounded up". To see if you qualify for a discount, please contact Jay Harris at jmtacombine@sportimeny.com or by calling 516-484-9225 for more information. I agree that I am the parent or legal guardian of the JMTA College Recruiting Combine (the "Combine") applicant, and I hereby give permission for him/her to supply the information required to apply for participation in the Combine. 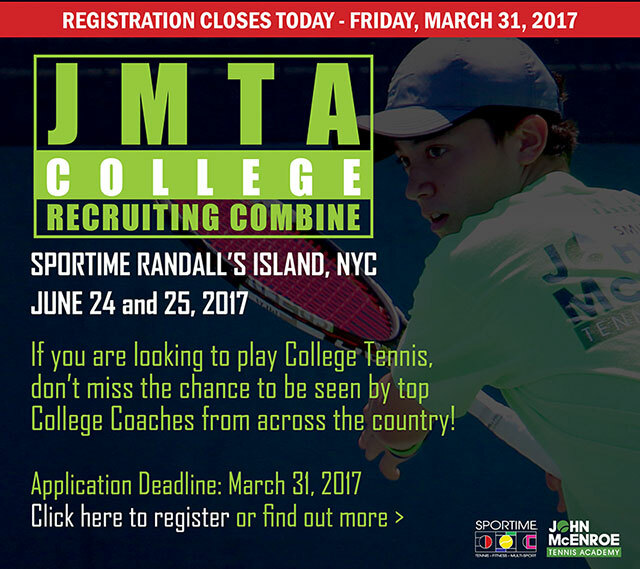 To find out more about the JMTA College Recruiting Combine, please contact Jay Harris at 516-484-9225 or jmtacombine@sportimeny.com. Division I, II and III schools from top conferences including the Ivy League, the ACC, the Big East, the SEC, the Big 10, the Patriot League, the NESCAC and others. View a list of committed colleges for 2019.